It has become a given in mobile marketing that the first stabs at marrying device screens to living room TV screens did not pan out quite the way TV programmers and many advertisers hoped. The first wave of second-screen apps tried too hard to capture users' interest while they were watching the big screen. Many of them felt more like Tamagotchi than complements. The relentless social media streams and trivia pop-ups were overwhelming. No one wants to tend a second-screen app while watching the main attraction. It does turn out that viewers are in various modes of engagement with their second screens when the TV is on. They occasionally engage with and monitor others via social channels. But this social activity occurs at a pace and on the channels of the users’ choosing, not corralled into the pens designed by programmers. And so we get things like Twitter ratings from Nielsen, and Facebook whining that people are using their feeds to converse about shows. 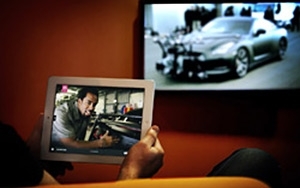 Second-screen engagement with TV content is evolving, highly variable according to occasion and TV genre. The latest iteration of RingDigital’s SocialTV Index of user-reported social TV habits shows some changes in just over six months. When asked in September 2014 what TV genres users posted about online, 43.9% said sports, 40.6% cited news, 33.6% drama, 29.9% reality programming and 27.5% sitcoms. In April of this year, however, the ranking had shuffled, with drama now posted about by 41.9%, sports 40.5%, news 37.5%, sitcoms 30.6% and reality 28.9%. Interestingly, just a few years ago the lion’s share of second-screen activity appeared to involve reality programming, which favored social interaction on many levels. Starting with “American Idol” live polling many years ago, reality TV was the original second screen experience. But apparently now those habits have migrated across other genres more dramatically. And, as is always the case in emerging media, consumers find ways of interacting with and sharing new technologies that none of us saw coming. An estimated 20 million American -- 21.5% of DVR users -- are now posting video clips of what they're watching. New apps like WhipClip try to smooth this process by making TV clips shareable. But as usual, people are taking things into their own hands with new live-streaming apps like Meerkat and Periscope. In fact, this emerging habit is going to create copyright headaches. During last night's season premiere of HBO's "Game of Thrones," a number of Periscope users live-streamed the entire episode, prompting Twitter to remind users that such violations of the company's terms and conditions could lead to accounts being shut down. Moreover, despite the common metrics for “Twitter TV” that Nielsen reports weekly, that social network is not only a minor arena for TV chatter, but it is losing ground. In August, 70.4% of respondents said they posted TV-related content on Facebook, and 34% on Twitter. But by March 2015, Facebook was attracting 75.6% of posters to Twitter’s 25.4%. Twitter has lost 25% of share in less than a year. RingDigital acknowledges that Twitter has special strength still in sports and news, where it functions as a real-time feed of breaking news. Ring Digital founder Brian Ring says in the report, “Twitter has done a fantastic job in the past month or two in pivoting toward a B2B and B2B2C approach that will serve them well. Periscope, TV Timelines, and Curator are three new products that Twitter has launched in just the last month. Twitter is an influencer's platform. That makes Twitter incredibly powerful and special. But it doesn't make them Facebook." Posting social chatter about TV content is still a minority activity, with only about a quarter of consumers saying they do so, and this is up only slightly from findings last summer. My guess is that the share of people actively sharing thoughts about TV on social channels will stay roughly the same. A small share of the audience is content creators. Still, the trick is how marketers can best take advantage of this parallel stream of TV-related content. One way is for social media being able to detect and better present TV chatter about hot topics. Another part of this trend will be the evolving set of viewers fumbling with the tools at hand to decide how they really do want to “watch TV” in the future. 1 comment about "For Social TV, We're Still Fumbling With The Remote". brian ring from ring digital llc, April 15, 2015 at 1:34 a.m.